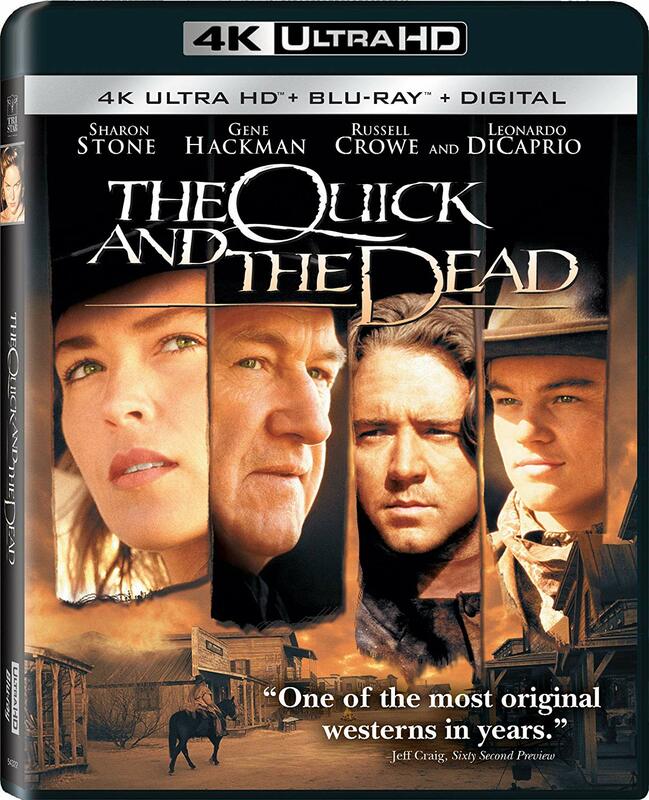 Sam Raimi’s hyper-stylized 1995 western The Quick and the Dead has just gotten a 4K Ultra HD upgrade. While the film received mixed reviews at the time of its release and was a box office flop, it has also gained somewhat of a cult following over the years. The film stars Sharon Stone as a mysterious female gunslinger in the wild west who rides into the town of Redemption with unfinished business, and puts her name down to prove her stuff in their annual showdown, which consists of a series of gunfights to the death. The town is run under the iron fist of Mayor John Herod (Gene Hackman), who’s cocky son (Leonardo DiCaprio) fancies himself to be a perfect shot, and the residents include a collection of quirky characters who challenge each other to the daily gunfights in order to prove their worth. Herod’s former henchman Cort (Russell Crowe), who left town and has returned as a preacher who now renounces violence, is also forced to sign up for the fight, despite his best wishes. The plot itself is somewhat thin, offering a pretty standard story of vengeance and shootouts that mainly riffs on the tropes of most classic westerns. But The Quick and the Dead updates these themes through its genuine embrace of pop art style, and Dante Spinotti’s showy and inventive cinematography remains one of the chief selling points of the film. The shootouts play like Sergio Leone taken to the extreme, with ample use of Dutch angles and quick zoom-ins on the opponents’ eyes, intercut with looming shots of the clock in the town square counting down to the moments of gunfire. The other element of the film that continues to stand out is the cast. Sharon Stone does fine work in the lead as a sort of “Woman With No Name,” and she is backed up by an ensemble of familiar faces both young and old. The film is notable for featuring an incredibly young Leonardo DiCaprio and for giving Russell Crowe his first American role, and it also includes memorable appearances from recognizable character actors such as Roberts Blossom and Keith David. While The Quick and the Dead is seen as somewhat of a lesser entry into Sam Raimi’s filmography, it is chock full of the same stylistic trademarks and over the top bloody violence that has defined many of his other films. Yes, it could be argued that the film is largely an exercise in style over substance, but it’s a lot of fun to watch, and worth revisiting now that it has gotten a 4K upgrade. The disc also includes seven “never before seen” deleted scenes, as well as the original theatrical trailer for the film. A regular Blu-ray disc is also included in the package. The Quick an the Dead is a Sony Pictures Home Entertainment release. It’s 105 minutes and rated 14A.